July 12, 2017– Maryville’s Jen School, which provides specialized academic and vocational education, and social emotional learning, will begin accepting female students in the fall of 2017. The school’s request to go coed was granted by the Illinois State Board of Education this week. April 7, 2017 — Maryville honored Richard and Roxelyn Pepper for their commitment to the protection and development of children. 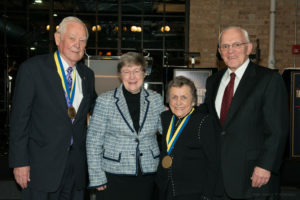 The couple was given Maryville’s Guardian Medallion Award by Richard A. Devine, chairman of Maryville’s board of directors . The Peppers will be honored for their support of Maryville’s Center for Children. The Center for Children houses two of Maryville’s most innovative programs. The Center for Children houses the Crisis Nursery, a safe haven which offers 24-hour childcare and parental support to families facing crises such as domestic violence and medical emergencies. It provides short-term care for families experiencing a disruptive event, to help them return to stability and to prevent a further decline in circumstances. It is the only crisis nursery serving Cook and Lake Counties. The Center for Children also houses Maryville’s Children’s Healthcare Center which provides transitional care for children who are medically fragile and dependent on technology. It provides training for parents, caregivers and siblings to help them become more competent and confident when attending to the fragile child’s specialized needs. It is one of only two pediatric transitional healthcare facilities in Cook County. Richard and Roxelyn Pepper have a long history of supporting children and families. “Their support for the Marvyille Center for Children will help us provide a safe and nurturing place for our most vulnerable children and support their families,” Sister Ryan said.